The silence of Järvenpää was not absolute. Although Sibelius wrote no major works between 1927 and his death thirty years later, he did produce some music. One of the last creative tasks he completed was the 1948 orchestration for strings and harp of Ett Ensamt Skidspår (Lonely Ski-Trail) which was originally written for piano and narrator in 1924. Ett Ensamt Skidspår was first recorded in 1993 by the Ostrobothnian Chamber Orchestra conducted by Juha Kangas for the Finlandia label. My copy of the original CD, which was released in 1996, is seen above. 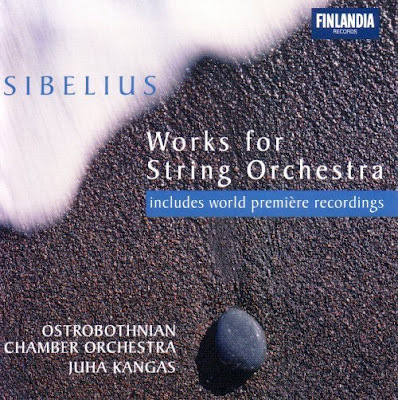 The Finlandia release of Works for String Orchestra by Sibelius has now transferred to Warner's budget Apex label in different packaging, and it is quite a bargain. As well as Lonely Ski-Trail there is another Sibelius premiere recording on the disc, Grevinnans konterfej (The Countess's Portrait). The programme also includes Rakastava, Andante Festivo, and other more familiar works. The Finnish narrations on the two short first recordings should not put purchasers off. They are more an additional instrumental line than a vocal intrusion. All the performances are truly authentic, and the sound engineered by Bertil Alving in Kaustinen Church, northern Finland, has a bloom that is missing from most studio acoustics. One very minor gripe; the narrations for the two premieres were over-dubbed a year later in Finnvox Studios, Helsinki rather than being recorded in the same ambience. But let's be quite clear. If this disc contained mainstream repertoire it would be a strong recommendation. Those two Sibelius premieres make it unmissable. In the current economic climate of 'here today, credit-crunched tomorrow' it is best to snap it up today. Because the excellent Finnish Music Information website is predicting a new silence of Järvenpää. The first Finlandia albums came out in 1979 and the company’s original raison d’etre was to concentrate on old and new local music. But in the 1990’s the label began releasing works by non-Finnish composers as well. Finlandia has released landmark recordings by composers such as Joonas Kokkonen, Aulis Sallinen, Magnus Lindberg, and of course, Jean Sibelius. As part of the Warner/Bros, the future of the label remains to be seen: the activities have stopped in Finland, and the headquarters are in Stockholm. The promotion of Warner-Finlandia classical catalogue and releases is non-existent in Finland, and seems to operate mainly abroad. It seems the history of the legendary Finlandia is about to vanish from the map of the Finnish recording companies. The Finns are also smart with technology. Read how an internet archive combines contemporary music with new technology. The reader reviews on Amazon are priceless. I notice that a review for that CD on amazon.co.uk makes the very perceptive observation 'You may or may not like this CD'. 'That was the final movement which concludes William Walton's First Symphony'.